Per a Department of Health memo from 2/19/92, there are nine sites of concerns at the Red Hill facility. Testing found high levels of chemicals such as Benzo perylene, Benzo fluoranthene, Chrysene, Dibenzo anthracene, Indeno pyrene, and Henanthrene. Total Fuel Hydrocarbons (TFH) and Total Petroleum Hydrocarbons (TPH) were also found at high levels. A 1983 study analyzed sludge in the pit and found elevated concentrations of polynuclear aromatic hyddrocarbons (PNAs), phenols, heavy metals and volatile hydrocarbons. A 1987 study found that soil was contaminated around and below the pit. The following information is quoted directly from documents recovered by Carroll from the Hawaii State Department of Health. These documents are for historical reference and should not be used to draw conclusions about today's situation. "The United States Navy began constructing the Red Hill Fuel Storage facility in 1938, and by the time the construction ended, the facility had 20 large Underground Storage Tanks (UST), each with a capacity of about 12.6 million gallons. These tanks were used to store Navy special fuel oil (NSFO), diesel fuel, jet fuel (JP-5), aviation gas (AVGAS), and motor gasoline (MOGAS). A system of tunnels with access portals known as Adits, were constructed to connect the USTs to each other and also to the associated Naval facilities. The Red Hill Oily Waste Pit Facility was constructed as an oily waste reclamation and disposal facility during the early 1940s and was connected to the Red Hill Fuel Storage USTs. 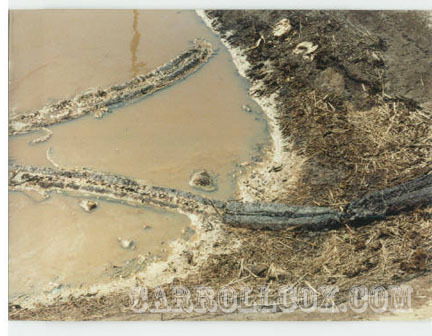 The original oily waste pit was active from 1943 through 1948. Later, a Stilling Basin was constructed approximately at the same site in 1972, and was intermittently used through 1986, to deposit oily waste such as bottom sludge and rinse water generated from cleaning the USTs and also the leaks in valves and pipes within the Adit system. The investigation included ten Exposure Areas of Concern within the site confines and also an adjacent parcel owned by the United States Coast Guard. The entire site area lies directly over the Pearl Harbor Basal Aquifer, which is a major drinking water source for the island of Oahu." "The site of the oily waste pits is located approximately two miles east of the East Loch of Pearl Harbor. 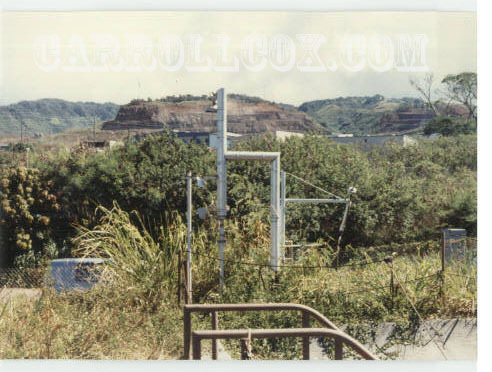 It is situated about 700 feet northwest of the Red Hill freshwater pump station, 4,000 feet east of South Halawa Stream. Surface elevations in the vicinity of the site range from approximately 100 to 200 feet above mean sea level, generally sloping down from the site towards South Halawa Stream. The site overlies the groundwater aquifer known as the Moanalua Artesian Basin." Picture is labeled: Red Hill Oily Waste Basin, September 26, 1990. View of oily waste basin looking east. "Two disposal pits have been used for the treatment and disposal of oily wastes generated from the Red Hill underground storage tanks. The original pit, constructed in 1943, was unlined and received bottom sludges from the cleaning of the bulk storage fuel tanks at Red Hill. After gravity separation of the water and oil fractions, the water fraction was either evaporated or discharged to South Halawa stream. Then, the oil fraction was reportedly ignited, occasionally with other materials such as tires and wood. It was also reported that on occasion, discharges of oily water and oil to the stream occurred. In 1948, the pit was excavated to depths beyond any visible oil penetration. To preclude any possibility of contamination of the groundwater, the disposal of oily waste to the pit was discontinued. Thereafter, waste sludges from the storage tanks were hauled to offsite storage facilities in the Shipyard. Some discharges of oily water from the bulk storage tanks to the stream continued as the site was used to collect and store waste materials. in 1972, an asphalt-concrete lined pit was constructed in approximately the same location. The pit was used to separate and evaporate the water fraction from tank sludge. The oily fraction was hauled to the NSC Waste Oil Reclamation Plant. It is suspected that some water from the pit was diverted to the stream due to improper valve operations at the pit. In addition, it was reported that on at least two occasions sludge from the pit was dumped into a vegetated area in the vicinity of the pit. The pit was finally taken out of service in 1987, due to potential contamination identified by a Site Inspection (S() conducted un the Installation Restoration (IR) Program.